It is no surprise that inflammation is one of the most common issues that I see as an Ayurvedic practitioner. Although the cause and the manifestation may look different for each individual, the result is the same. Inflammation is often revealed as redness, irritation, heat, swelling, and tenderness. This can be an obvious manifestation such as a rash on the skin, painful swollen joints, or sore muscles, or a not so obvious occurrence such as inflammation in the stomach, small intestines, liver, or colon. 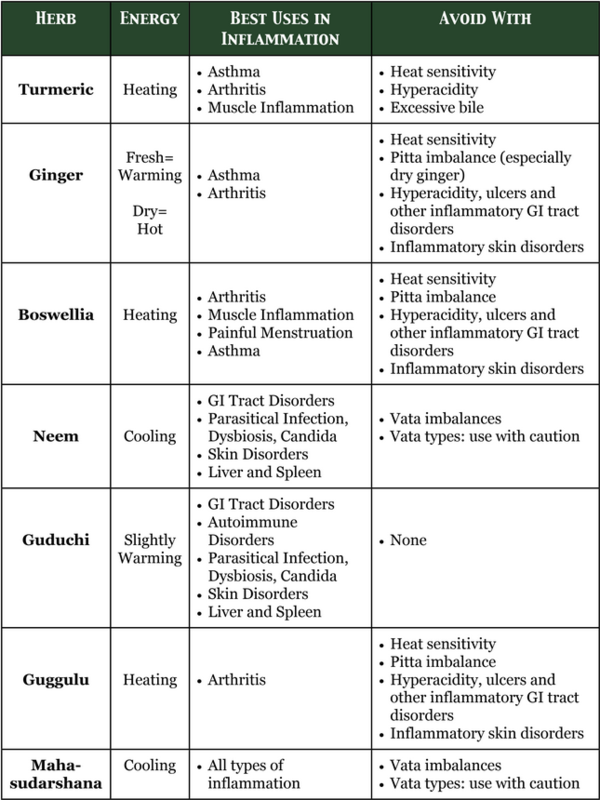 The location of the inflammation, along with the individual’s specific body type (aka dosha type) and current inflammatory symptoms will all be important factors for which herbal treatment will be the most effective for them. The first line of treatment for any disorder is always to remove the cause. Whether you are suffering from arthritis, inflammation in the GI tract, inflammatory skin issues (i.e. eczema, psoriasis, rash, etc), or anything in between, the common causes (or at least instigators) will be of a similar nature. Here is a non-exhaustive list of some red flags to look out for in your diet and lifestyle. Once you have identified some of the potential causes that are creating the inflammation in your system, you can then begin to slowly, but surely make the needed changes to rid these factors in your life. While you are working to make these essential changes in your routine, it will be beneficial to simultaneously be taking the appropriate herbal regimen to expedite this healing process. Taking these recommended herbs will not only help reduce the inflammation in your system, they will help rid the body of excessive heat, toxins, and irritants that are provoking your symptoms. Although many herbs contain anti-inflammatory properties, some are more powerful and effective than others. Further, some may be extremely useful in one inflammatory condition (for example arthritis), while another may be of more benefit for a different inflammatory condition (say psoriasis). Here is a list of the top seven herbs to use, the best way to take them, when to take them and when to avoid them. Turmeric is an amazing anti-inflammatory herb that can be used on a daily basis whether in your diet, in herbal teas or more powerfully as an herbal powder. Although turmeric is fairly safe for most individuals, it can be a bit heating for those that are sensitive to this issue. In these cases, a more cooling herbal treatment is recommended such as Neem or Mahasudarshana (as seen below). Turmeric is fairly well-rounded in its anti-inflammatory properties and can therefore be taken for multiple conditions. However, it is most effective in inflammatory conditions such as arthritis, inflamed muscles, and inflammatory asthma. 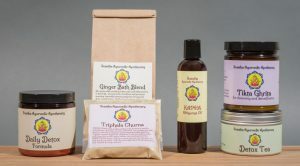 Take 1/4 tsp turmeric with 1/8 tsp boswellia (frankincense), 1/8 tsp dry ginger, and 1/4 tsp guduchi. Mix this in warm water and take three times daily before meals. Take 1/4 tsp ginger, 1/4 tsp of turmeric, a pinch of black pepper, and a pinch of pippali powder daily with honey. Take the first dosage upon awakening on an empty stomach. Take the second dosage around 2-3pm. If acute symptoms arise, take a double dosage of each herb with honey every 2-3 hours or as needed. Click here for our Turmeric, Ginger and Tulsi Tea Recipe! Ginger is a powerful anti-inflammatory herb commonly used in Ayurvedic medicine. Just as with its sister root turmeric, it can be taken in food, as an herbal tea, or more potently as an herbal powder. Although ginger is fairly safe for most individuals, it can be too heating for Pitta types or for those that have a heat sensitivity. In these cases, fresh ginger should be used (which is much less heating) or a more cooling herbal treatment such as Neem or Mahasudarshana (as seen below). 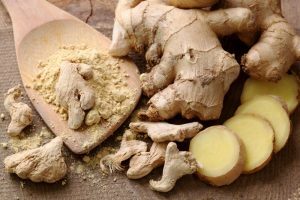 Since ginger is heating, it is often not as beneficial in inflammatory GI tract disorders such as hyperacidity, gastritis, ulcerative colitis, ulcers, and similar disorders. It should also be avoided in heat induced inflammatory skin disorders such as eczema, psoriasis and rashes. Instead, the most effective use for ginger is in inflammatory asthma conditions and in arthritis, as it has an affinity to both the lungs and the joints. 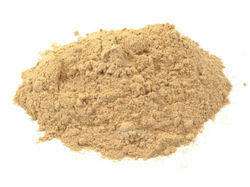 Ginger helps to clear the bronchial pathways in asthma and helps to remove stored up toxins in the joints for arthritis. Make a strong ginger tea using 1 Tbsp freshly grated ginger (best for Vata and Pitta) or 1 tsp dry ginger powder (best for Kapha) and 1 cup of boiling water. Steep on a low heat for 15-30 minutes before straining. Once strained, add in 1/2-1 tsp of organic castor oil to the ginger infusion. Take this each night before bed. This mixture should not be taken for over 30 days without the guidance of an Ayurvedic practitioner. 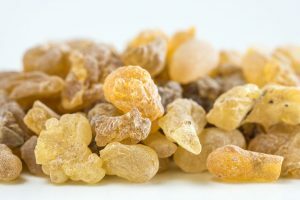 Boswellia, often known for its aromatic benefits, is actually one of Ayurveda’s most powerful and effective anti-inflammatory medicines. Although very effective, this resin is not to be taken lightly due to its potently heating properties. This means that this may not be the best option for Pitta types, or for any heated inflammatory condition such as hyperacidity, gastritis, ulcerative colitis, ulcers, and similar disorders. It should also be avoided in heat induced inflammatory skin disorders such as eczema, psoriasis and rashes. Boswellia instead should be a main herbal treatment for arthritis, inflamed muscles and asthma. With a special affinity for the reproductive system, boswellia also helps relieve cramping and pain during menstruation caused by inflammation and congestion in the uterus. However, due to its circulatory enhancing properties, boswellia can increase menstrual bleeding and should be discontinued if the cycle becomes excessively heavy. 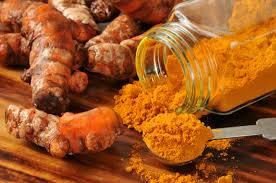 Take 1/4 tsp turmeric with 1/8 tsp boswellia, 1/8 tsp dry ginger, and 1/4 tsp guduchi. Mix this in warm water and take three times daily before meals. 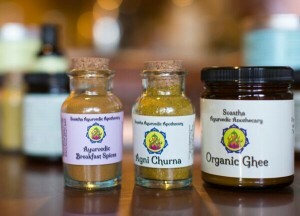 Take 1/8 tsp of boswellia mixed with 1/4 tsp turmeric and 1/4 tsp ginger. Mix in 1 tsp of honey and take twice daily in warm water. Take the first dosage upon awakening on an empty stomach. Take the second dosage around 2-3pm. If acute symptoms arise, take a double dosage of each herb with honey every 2-3 hours or as needed. Make a strong ginger tea using 1 Tbsp freshly grated ginger (best for Vata and Pitta), or 1 tsp dry ginger powder (best for Kapha) and 1 cup of boiling water. Steep on a low heat for 15-30 minutes before straining. Once strained, add in 1/8 tsp boswellia powder. If needed, honey can be added after the tea has cooled a bit. Take this tea 2-3 times daily, 1-2 days before menstruation to prevent the pain and cramping and as needed during the menstrual flow. **Due to its circulatory enhancing properties, boswellia can increase menstrual bleeding and should be discontinued if the cycle becomes excessively heavy. 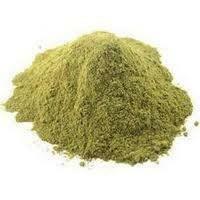 Neem is an effective anti-inflammatory herb that is widely used in Ayurvedic medicine. Unlike the three herbs mentioned above, this bitter leaf is extremely cooling and can be used during times of increased heat and Pitta in the system. This makes it an excellent choice in most inflammatory GI tract disorders such as colitis, gastritis, Chron’s disease, ulcers, parasitical infection, yeast overgrowth, and hyperacidity. With a strong affinity for the liver and skin, this herb is equally as useful in inflammatory skin disorders such as psoriasis, eczema, rash and acne, as well as general inflammation of the liver (and spleen). 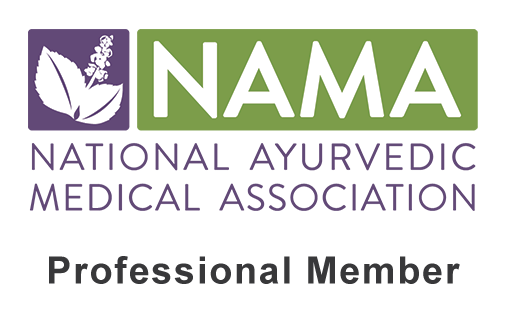 **Please note that due to the powerful cooling and bitter properties of neem, it is not often recommended for Vata types or during times of Vata imbalances. Take 1/4 tsp of neem, 1/4 tsp shatavari and 1/4 tsp licorice powder mixed with 1/2 tsp of melted ghee in 1/2 cup of warm water. Take this three times daily, 15 minutes before meals. Take 1/4 tsp of neem and 1/2 tsp guduchi in 1 Tbsp of aloe vera juice. Take this three times daily before meals until symptoms subside. While taking this dosage, it is also recommended to apply a neem infused oil such as our Pitta Oil onto the affected skin areas. Alternatively or simultaneously, one can take 1 tsp of Tikta Ghrita (bitter ghee), twice daily. Take the first dosage before food each morning, and the second before bed. 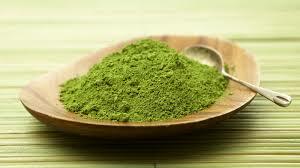 Take 1/2 tsp guduchi, 1/4 tsp neem and 1/4 tsp vidanga in 1/2 cup of warm water. Take three times daily before meals. Alternatively, one can take 1/2 tsp of our Daily Detox Formula three times daily before meals. For more potent results try our Parasite Cleanse Tincture. Take 1/4 tsp neem, 1/4 tsp guduchi, and a pinch of pippali powder with 1 Tbsp organic aloe vera juice. Wash down with warm water. Take this mixture three times daily before meals until symptoms improve. For more potent results try our Love your Liver Tincture. Guduchi is perhaps one of the most balanced of the anti-inflammatory herbs on this list, and still equally effective in its properties. In fact, due to its sattvic (balanced) nature, this herb can be taken by all dosha types and in slightly larger dosages. Further Guduchi is often the herb of choice in a wide range of inflammatory issues including GI tract disorders (colitis, ulcers, hyperacidity, candida, parasites, dysbiosis, etc), liver and spleen inflammation, inflammatory skin disorders (psoriasis, eczema, acne, rash, etc), and arthritis. Guduchi is a great choice for many autoimmune diseases as it not only works to reduce the inflammation, but as an immunomodulator, it also helps to regulate the immune system. Take 1/4 tsp of guduchi with 1/4 tsp shatavari and 1/4 tsp licorice powder. Take this mixed with 1/2 tsp of melted ghee in 1/2 cup of warm water. Take three times daily, 15 minutes before meals. Take 1/2 tsp guduchi and 1/2 tsp ashwagandha in 1/2 cup of warm water. Take three times daily, before meals. Take 1/4 tsp of neem and 1/2 tsp guduchi in 1 Tbsp of aloe vera juice. Take this three times daily before meals until symptoms subside. Alternatively or simultaneously, one can take 1 tsp of Tikta Ghrita (bitter ghee), twice daily. Take the first dosage before food each morning, and the second before bed. Take 1/2 tsp guduchi, 1/4 tsp neem, and a pinch of pippali powder with 1 Tbsp organic aloe vera juice. Wash down with warm water. Take this mixture three times daily before meals until symptoms improve. 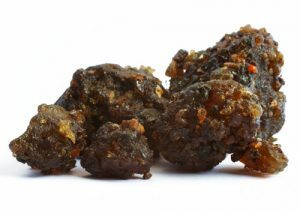 Purified guggulu resin (shuddha guggulu) is another herb of choice when treating inflammation. However, guggulu is heating by nature and should be used with caution with Pitta types. In fact, the best guggulu for Pitta types is often kaishore guggulu, whereas the other varieties should be avoided. Guggulu should be avoided with heated inflammatory conditions such as hyperacidity, gastritis, ulcerative colitis, ulcers, and similar disorders. It should also be avoided in heat induced inflammatory skin disorders such as eczema, psoriasis and rashes. For these disorders a more cooling options such as neem, guduchi or mahasudarshana churna would be more appropriate. Instead, guggulu has made our top anti-inflammatory list due to its powerful ability to reduce arthritis and arthritic symptoms. For this reason it is effectively used in many Ayurvedic formulations when treating all types of arthritis. One can use either plain guggulu, or a more appropriate guggulu formulation such as yogaraj guggulu for Vata-type arthritis (i.e. osteoarthritis) or punarnava guggulu for Kapha-type arthritis (i.e. fluid retaining, cool, damp type arthritis). As mentioned above, one with Pitta-type arthritis should use kaishore guggulu or a more appropriate cooling formula. Take 1/2 tsp of guggulu mixed with 1/4 tsp of ginger and 1/4 tsp of guduchi. Steep this in 1/2 cup of warm water and take three times daily before meals. Although not an herb but rather a traditional Ayurvedic formulation, we couldn’t help but mention Mahasudarshana as it is one of the most effective ways to reduce almost all types of inflammation around. Beneficial for most inflammatory issues including inflammatory skin disorders, inflammatory eye issues, liver and spleen imbalances, GI tract disorders, parasitical infection, and asthma, this cooling bitter formula is a great option all on its own. **Please note that due to the powerful cooling and bitter properties of Mahasudarshana, it is often not recommended for Vata types or during times of Vata imbalances. Take 1/2-1 tsp of Mahasudarshana first thing in the morning on an empty stomach steeped in warm water. Take this dosage again before bed for severe inflammatory issues. **For acute conditions, one can take 1/2 tsp every 2-3 hours or as needed. Very interested in your products as I suffer from digestive problems. I am currntly taking a tablet to help me but I wish to stop this. I do not eat red meat. I also need to be very careful what I eat.